Re-UPDATE: WOW! So far, we have 16 wannabe Commissioners! Thanks for the great response! And, if you're like Bo and want to add more thoughts, drop me a line and I'll keep your thoughts together - even if you can't! HA! Hey folks! I don't know what version of the Blog Bat-Around we're on, or if there is an official method for announcing such a thing, but I thought I would start one up! 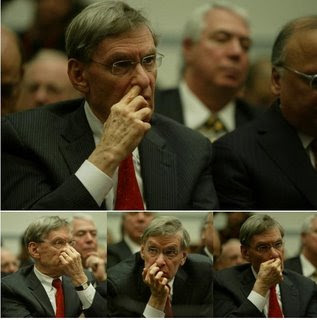 The topic: With Bud Selig supposedly retiring in 2012 (and assuming the end of the world doesn't follow soon afterward), if YOU were asked to become the next Baseball Commissioner, what would you do? What changes would you like to make, what things would you leave as-is, what would you like to see as your legacy when your retirement time came? How the Blog Bat-Around works: Post your answer to the topic on your blog, then comment here with a link to your post. I will update this post as entries come in so folks can find your thoughts! I'll be posting my own thoughts before long, but wanted to get the word out there. My last one - I promise! David, edited my post to make it more reader friendly. Thanks. Mine is about halfway done. Editing out all the @%$!s is taking forever. I'll try to knock it out tonight. I think the first thing I would do is make sure I didn't get photographed like this!